Aug5 by John M. Buol Jr.
U.S. Army Reserve Competitive Marksmanship Program shooters made a clean sweep of the podium for the NRA High Power Nationals. Competing in the Service Rifle division, SGT Nickolaus Mowrer took first place Service Rifle with a new Army Reserve National Record of 2381-114x. He also finished 3rd in the overall aggregate among Match Rifle shooters. MSG Robert Mango took second place and SPC Bryant Wallizer took third. For the overall, USARCMP shooters . power service rifle competitions, took 3rd. The Army Reserve had an incredibly strong finish in the individual aggregate taking home a number of trophies and 1st,2nd,3rd,5th,6th,& 7th place Service Rifle. Congratulations and good luck to our shooters as they start NRA Long Range competition today. MSG Robert Mango 2nd, SPC Bryant Wallizer 3rd, CPT Samuel Freeman 5th, SFC Joel Micholick 6th, SSG Kris Friend 7th, and CSM Steven Slee 11th. The Vandenberg Cup is presented to the winner of an aggregate of the scores fired in the Members’ Trophy, Scott Trophy, Coast Artillery Trophy and Army Cup Matches. SGT Mowrer won the Vandenberg Cup with SPC Wallizer taking 3rd and MSG Mango taking 5th. MSG Mango won the Scott Trophy for winning the 200 yard rapid fire stage. SGT Mowrer won the Appreciations Cup match and Members’ Trophy and took second in the Erdman Trophy match. CSM Slee won the Coast Guard Trophy match. For team events, Army Reserve Anderson took second the Enlisted Men’s Trophy Team match. With MSG Norman Anderson as Team Coach and SGM James Mauer as Team Captain, CPT Freeman, MSG Mango, SFC Micholick, and SSG Friend fired the team-winning score. 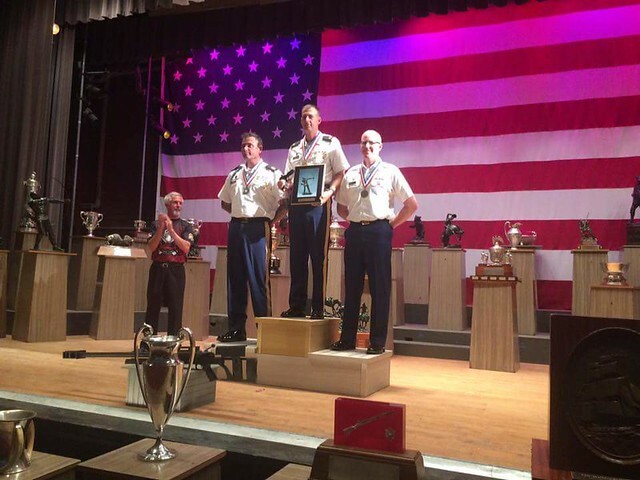 MSG Mango, SGT Mowrer, and SPC Wallizer won the NRA High Power Service Rifle Nationals. This entry was posted in Service Rifle and tagged FY16-summary, NRA.